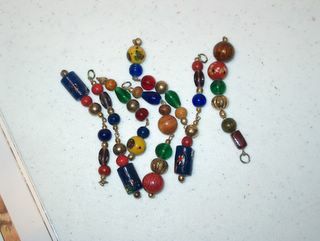 Glass Beads. If I were to admit one thing about my self it is this, I am a thrift store junkie! I bought these glass and wood beads today, I thought it was a bracelet actually, for a whole $1.06!!! I have plans to make them into a bracelet. I like to colors of the glass beads the best. I can only wonder what they were hanging from before.